Throwing the football is apart of every offense in the modern day. Teams began throwing the football down the field once the NFL rules allowed it. Who innovated the passing offense? Don Coryell innovated the offensive passing system with the use of downfield passing attack. Players who excelled from this system are Dan Fouts, Charlie Joiner, Kellen Winslow. In 1978 Don Coryell became the Head Coach of the San Diego Chargers. He had incredible talent on his offense with future Hall of Famers Dan Fouts (QB), Charlie Joiner (WR) and Kellen Winslow (TE) along with multiple other Pro Bowl players. Coach Coryell developed an offense that attacked defenses downfield as he wanted to use the immense talent on his team. This is a change from the Pro-Style offense that features two running backs and is less aggressive in attacking downfield – which created the Air Coryell. The “Air Coryell” offense helped the Chargers lead the league in passing yards in 6 of the 9 seasons he was the coach. By focusing more on the downfield throw, this offense has a lower completion percentage by nature (it is inherently riskier to throw the ball further downfield than throwing it shorter distances). With these deeper throws, the offense became more based on timing to increase its effectiveness to compensate for this. When you watch a College or NFL game today, you will see the vast majority of shotgun formations with 3+ Wide Receiver sets. 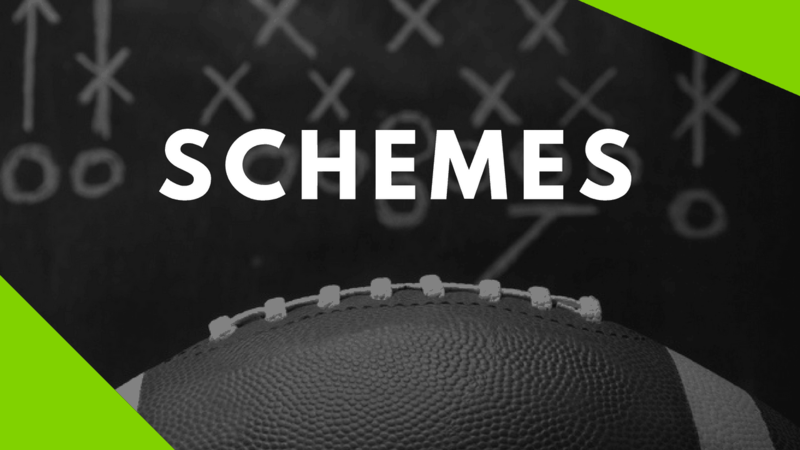 While it is commonplace today, Coach Coryell put together a scheme to make it work week in and week out, year over year at a time when no one was doing it. His innovative approach to the way offenses move the ball downfield place him in the highest regards as an offensive mastermind among his peers. Before Rob Gronkowski or Tony Gonzalez, there was a Tight End prototype that had the body of an offensive lineman but had the ability to move and catch like a Wide Receiver. His name is Kellen Winslow. The beauty of the “Air Coryell” scheme was that this rare talent was unleashed and defenses were not use to it coming from the middle of the field. 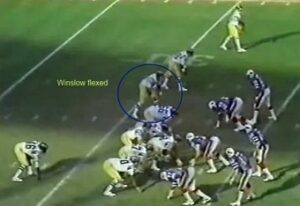 As shown below, the ‘Air Coryell” was the beginning of moving the tight end away from the rest of the offense line and creating havoc for defenses. Defensive coaches had to now change their tactics in response to this new offense. While they were use to a big front 7, they now had to account for all of these deeper passes. It is most noteworthy that the Air Coryell is the reason that Nickel and Dime look defenses came to be. This defensive innovation to adjust to an offense is now a mainstay on Sundays and almost every other level of football. The Air Coryell offense forever changed the NFL and has had much success since its creation. Coaches Joe Gibbs, and Mike Martz,won Super Bowls running versions of this offense. Former Head Coach and Offensive Coordinator Norv Turner made a career off of running versions of this offense. Other coaches have implemented pieces of the offense. Bill Belichick is quoted as saying that the pass-catching tight ends are “all direct descendants of Kellen Winslow”. With all the success he has had with Rob Gronkowski, it is fair to assume he has studied the Air Coryell system. Marty Schottenheimer is quoted as saying “putting three receivers on one side and flooding that area” probably originated from the Coryell offense. Do you have any questions about the Air Coryell Offense? Let us know below!